Finally, our review has led us to specify two new topics, “Advancing access to insurance” and “Navigating the digital transformation”. 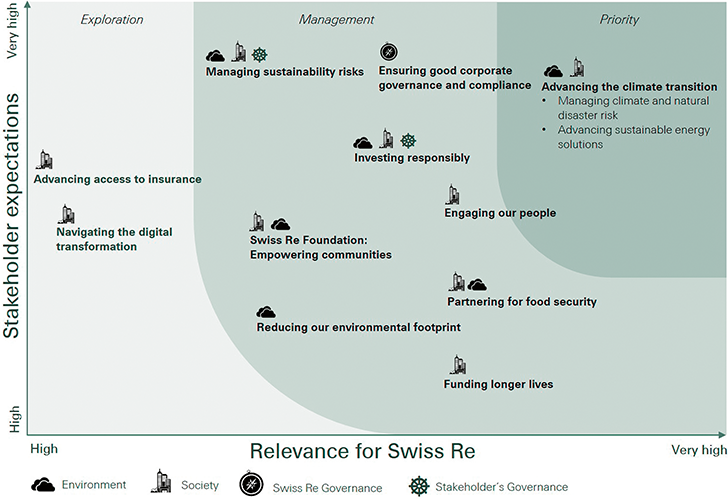 Reflecting our two main insight sources and in line with current best practice, eg the recommendations of the Global Reporting Initiative (www.globalreporting.org), our Corporate Responsibility Map is structured along the two axes of “Stakeholder expectations” and “Relevance for Swiss Re” – in terms of the risks as well as the opportunities they may create. We have positioned all our Corporate Responsibility Topics within this map and classified them into “exploration”, “management” and “priority”. Partnering for the goals (SDG 17). We are currently exploring how we can further align our activities with the SDGs.